Breakups are definitely difficult for everyone, especially if you are not the one ending things. 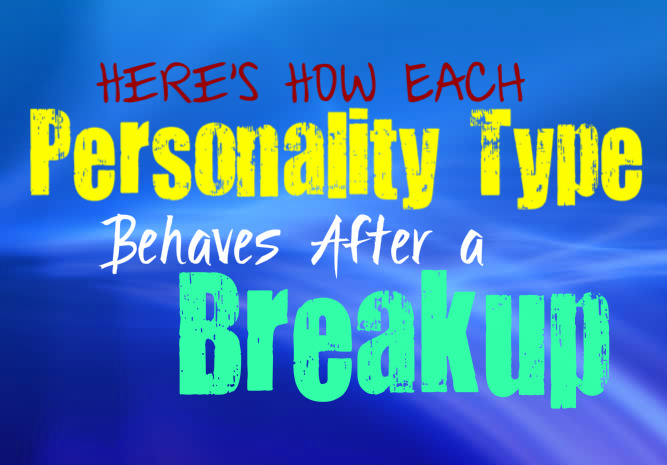 Here is how each personality type behaves after a breakup. INFJs often behave differently depending on why the breakup is occurring. If they are the one ending the relationship because the other person is hurting them or not good for them, they might have to door slam that individual. This will happen if the INFJ feels it is the only true way to separate from this person that they care for deeply. If the INFJ is not the one choosing to end things, they will likely be sad for a while and wallow in their pain. They will likely need to allow themselves to feel the sadness of the breakup, in order to fully heal and move on from it. INFJs feel things very deeply, but they are also capable of moving on if they believe it is necessary. There are some people who remain in their hearts forever, but the INFJ will find a way to move forward. ENFJs are constantly trying to move forward, and won’t want to fall apart in the midst of their breakup. They might even attempt to pretend that the breakup does not face them. ENFJs are always trying to hold themselves together, since they try so hard to care for their loved ones. If they are the ones ending the relationship they will likely feel sad about it, but might even feel like it is necessary to cut that person from their lives. If they are being dumped, the ENFJ just needs to wallow in their sadness for a few weeks before they can move forward. They will likely keep themselves busy, in an attempt to remain distracted. INFPs feel things very deeply, and because of this they might struggle to let someone go after a breakup. They might struggle to pull out of their sadness, and will need plenty of time to wallow. INFPs often need to accept that they will likely always feel a connection to that person, especially if they loved them. It is hard for INFPs to ever completely remove someone from their hearts, which is perfectly fine. They are warm and caring people, who have plenty of love to give. They will likely move on when they find someone else who they love just as deeply. When it comes to breakups ENFPs respond differently depending on the situation. If they are the type who dates casually, they will likely be fine ending those relationships. When the ENFP truly cares for someone though, they feel this very deeply. They will have a hard time ending things, since they likely will try to make it work with the person they love. Once the ENFP realizes that the relationship cannot be salvaged, they might find themselves quickly searching for a rebound in order to comfort them. They simply want to find a way to move one, since they will likely feel this loss intensely. ENFPs do best after a breakup when they have plenty of distractions to keep them going. INTJs often attempt to approach a breakup in the most logical way possible. They do not enter into a relationship without truly considering what it means to them, and if it makes sense. They will likely do whatever it takes to make things work, and will only end things if they realize that it is absolutely necessary. The INTJ will move on if they feel like this is the right thing to do, and their logical sense will help them cope with things. If the INTJ is not the one ending the relationship, they will likely have a harder time moving on. They take their commitments very seriously, and do not want to back out of something unless they believe it is the right thing to do. INTJs will find it necessary to keep themselves distracted after a breakup, and might even go out more than usual. Loyalty is extremely important to ENTJs, which might make breakups rather difficult for them. They do not jump into a relationship without being completely sure they are ready for it. ENTJs take their commitments very seriously, and will dislike feeling like they have given up on things. They will do whatever it takes to make the relationship work, and will spend days analyzing the situation before ending it. Once the ENTJ realizes that the relationship cannot be salvaged, they will come to terms with moving on. ENTJs might be sad for a little while, but will likely find things to keep them busy. INTPs will likely attempt to ignore their sadness, and will pretend like everything is fine. They prefer to be logical over emotional, which often causes them to bury their feelings. If INTPs feel ashamed of their feelings, it can make the healing process nearly impossible. They need to accept that there is nothing wrong with the way they feel, and that they simply are going through a normal spectrum of emotions. Once they learn to accept that their feelings are normal, they can begin to move forward. They simply need to spend some time wallowing in their emotions, and might even benefit from talking it out with someone they trust. ENTPs often attempt to move forward after a breakup, especially if they realize things should have ended. They do feel things very deeply, and might feel sad for a little while. They can often reminisce about the good times they had with that person, and might even feel like they should remain friends because of this. ENTPs do not like dwelling on negative emotions though, and will do best if they can find plenty of distractions to help them move forward. They will do well if they can throw themselves into a new project, and spend some time with their friends and loved ones. They will likely attempt to appear like things are fine, and do not want others to think they are struggling with the breakup. ISTJs take their commitments very seriously, and do not jump into a relationship without thinking about it. Once the ISTJ has committed to someone they have a truly hard time to letting go and moving on. They do not want to end a relationship without knowing that they have done everything they can to make it work. They will likely exhaust every possible attempt to mend things between them and their romantic partner. Once the ISTJ realizes that things cannot be fixed, they will find a way to move on. They will likely do best if they have plenty of distractions, and need to remain focused on the future. ESTJs often have a hard time ending relationship, since they take their commitments very seriously. They may feel like they have failed if they cannot make the relationship work and will take the blame upon themselves. ESTJs truly have a hard time moving on, and will want to do whatever it takes to make things work and mend what is broken. Once the ESTJ comes to terms with the fact that things cannot be salvaged, they will move on rather quickly and will do this by maintaining focus on their future. ISFJs will likely attempt to avoid a breakup at all costs, and want to do what they can to make things work. They might blame themselves if they cannot fix the relationship, and will be very hard on themselves over this. ISFJs dislike feeling like they have failed someone they love, and will want to do whatever it takes to fix the relationship. If the ISFJ realizes that things cannot be mended, they will spend a few weeks wallowing and will move on as best they can. ESFJs do love very deeply, but they also tend to move on quickly after a breakup. They will likely try very hard to make things work, and will constantly be trying to fix the relationship. Once they realize that things cannot be salvaged, the ESFJ will quickly decide to begin the healing process. They will likely keep themselves busy, and will throw themselves into different activities. ESFJs like to improve themselves after a breakup, in order to rebuild their confidence. They might even start dating rather quickly after things end between them and their partner. ISTPs will often approach a breakup as logically as they can, in hopes of understanding what went wrong. Once the ISTP has fully analyzed the situation, they will be perfectly capable of moving on. If it is clear to the ISTP that the relationship could not be salvaged, they will be able to cope with the breakup. They will likely throw themselves into different distractions and hobbies and might even search for a rebound to help them through. ESTPs will have a hard time moving on from a relationship if they have been dumped. If the ESTP feels like someone has rejected them, it actually affects them rather deeply. They will likely continue to try and make things work, and will attempt to convince the person that they should not end the relationship. Once the ESTP realizes they need to move on, they might find themselves going out rather often. They need to find plenty of distractions in order to cope with the breakup and move one with their lives. ISFPs feel things very deeply, and might have a hard time ending a relationship. Even when the ISFP is the one ending things, they will likely find themselves saddened by this. They will probably dwell on their pain for a while, and will spend some time alone just listening to sad music or enjoying the silence. ISFPs will do best if they spend time with their loved ones soon after the breakup, in order to help them pull through their sadness. ESFPs often do perfectly find with breakups, especially when they realize things were not meant to be. They do feel things very deeply, but they also do not see a point in dwelling on things. They will likely be sad for a little while, but quickly find that it is important to remain positive. ESFPs after a breakup find themselves eager to get back out there and have a good time with their friends. They might not be entirely interested in dating right away, but they will certainly enjoy a bit of harmless flirting.